“Germs and Jesus,” shouted the seven year old to her parents. 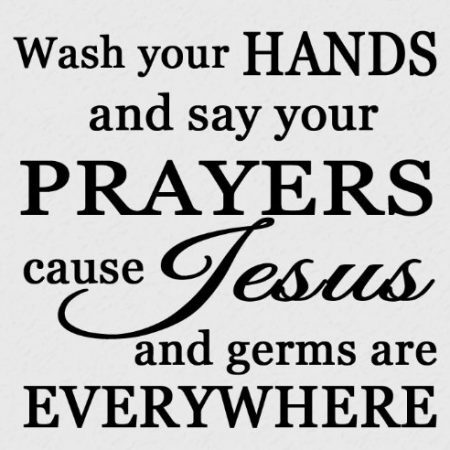 “Germs and Jesus! You keep telling me they’re important, and yet I can’t see any of them.” What this little exchange illustrates is that we parents believe that both the spiritual development of our children and their physical cleanness are important. It was no different in Jesus’ time. While our ancestors may not have appreciated the existence of germs, they certainly understood the importance of washing before meals. For the Jewish people physical purity had been elevated to an art form, with careful rules precisely formulated and exactly observed. Without the convenience of hot running water, and the efficacy of modern soap and detergent, staying clean in Jesus’ time was a time-consuming business. People that worked with their hands, like fishermen – the sort of people that Jesus spent time with – would not be able to afford the time to follow the purity rituals exactly day to day, and religious elites would sometimes use these lapses to criticise and even to discriminate. This discrimination is partly what Jesus challenges in the interaction with the Pharisees that we heard in the Gospel reading this morning; he also accuses the Pharisees of being so wrapped up in the rules that they were beginning to lose sight of the point of them. Jesus didn’t say that physical cleanness didn’t matter, but he warns that the human heart is the source of the greatest pollution. What comes out of a person, including their speech reveals the intentions of their hearts. One of the news stories that caught my attention this week is that of a defamation case being brought in America against the so-called ‘shock-jock’ and conspiracy-theorist Alex Jones. The radio host is facing charges because of pronouncements he made on mass and social media in the wake of the Sandy Hook Primary School shooting six years ago. Jones claims that the shooting never happened; that the story was part of an elaborate hoax by liberals promoting gun control; this despite the evidence of the dead bodies of twenty children and six of their teachers. Mr Jones’ claims have brought further pain to grieving families, collateral damage from his intention to support the gun lobby (or maybe just to court publicity for himself). The case is just one in a long line of cases that question the limits of free speech, and the role of the law and of companies like Twitter in censorship and truth-telling. It is perhaps tempting for us moderns to think that such communication issues are a modern phenomenon, associated with the many and varied platforms of mass and social media. There is of course plenty of research published and ongoing into the impact of communication technology on how we interact, but mass communication has its roots in the Greek and Roman period. If you were a monarch, politician, business-person even, the rise in democratic power in Greek and Roman times increased the importance of getting your message out. Those who belonged to the elite classes were taught the art of public speaking. The capacity of the Circus Maximus in Rome, where events were held on each of the seventy-five annual public holidays was, according to the writer and philosopher Pliny, equivalent to one-quarter of the adult population of the city. Similar theatres existed in major cities round the Empire. Those with the platform to speak publicly enjoyed the kind of viewing figures that Strictly or the Bake-off would be pleased with. It was into this communication environment that Jesus taught, and James wrote. The opening section of the Letter of James contains a series of isolated sayings, which the author expands on later in the letter. About speech he offers this: “be quick to listen, slow to speak … If any think they are religious, and do not bridle their tongues but deceive their hearts, their religion is worthless”. The author is certainly not censoring his message to avoid causing offence to the readership. In teaching that appears to be directly inspired by Jesus’ words, James expands his message in chapter three. Here he compares the power of the tongue to the rudder of a ship and a small fire in a forest, and describes it as “a restless evil, full of deadly poison. With it we bless the Lord and Father, and with it we curse those who are made in the likeness of God,” James observes. He goes on, “From the same mouth come blessing and cursing. My brothers and sisters, this ought not to be so”. I have taught my children to wash their hands before eating, although often we’re a bit lax about that. I thank God that they are not exposed to gun crime as children are in the United States. I’m not into censorship, but I do worry about how the tone of public discourse can affect the quality of conversation; that we are drawn into cursing our sisters and brothers who are all made in the image of God; that the communication marketplace is not level and can be manipulated, and that truth can be elusive (I guess there’s a conspiracy theorist in all of us). That’s why I will keep talking to them about Jesus who, by the purification of our hearts, has the power to save our souls.